Brain-computer Interface (BCI) Solving Problem of Attention Deficit and Anxiety for High Stakes Exams!! Every year, many students are required to take high stakes standardized tests like the SAT, ACT, AP, GRE, GMAT in addition to scoring good grades to get into Colleges and Universities. Low scores in classroom exams or standardized tests can make a significant impact on the educational opportunities, scholarships and even admission to Universities of choice to pursue STEM education. The root cause of low performance for a majority of students is stress-induced performance anxiety. Human performance in a high stress situation, particularly in high stakes exams is a significant problem for a large number of students going through our highly competitive educational system. This is because stress and anxiety have a debilitating effect on human performance. Even academically exceptional students fail to perform well in the standardized tests under stress and miss out on the opportunity to pursue their dream of becoming scientists or study technology, engineering, and mathematics (STEM). This is precisely why success in standardized tests and class room examinations is one of the biggest pain points in our educational system that needs immediate attention. Any solution that will provide a better way to subside or better manage this pain will be an extremely useful product for education and training applications across the globe. With the advent of portable consumer-oriented EEG, it is now possible to estimate levels of attention and shed light on this relationship in the context of a computer-based educational setting. Current work in neuroscience is directed towards identifying the brain basis of learning and attention in students. As this research advances, prospects are raised for identification and recognition, and for designing technological interventions that are suitable for different ages and to help them overcome any learning difficulties. IntellADAPT envisions to fill this unmet need and act as a learner performance enhancer for students who wish to stay in the STEM and successfully complete their college education. Using the principles of cognitive neuroscience, IntellADAPT has developed a new BrainiakTM platform and is pioneering the use of the BCI (Brain-Computer Interface) for STEM education. As shown in Figure 1, the BraniakTM platform facilitates the integration of learner analytics from five-dimensional aspects of learning – brain-wave, media, learning strategies, interactivity, and social interaction — to deliver a personalized learning experience. IntellADAPT has implemented and field tested this brain-computer interface (BCI) enabled BrainiakTM platform that uses real-time analytics of the brain wave data while learners are engaged in high-stress situations and provides feedback on improving performance under stress. The focus is on the successful transition of high-school students into Universities to increase the STEM pipeline. 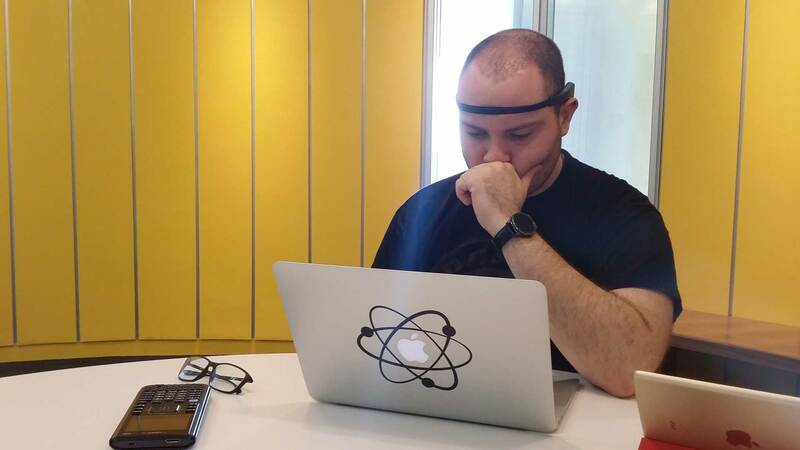 BrainiakTM is envisioned as the technology platform that will allow management of stress using real-time neurofeedback to learners using EEG headbands as the brain-computer interface. The innovation integrates EEG headband collecting brain wave data with machine learning algorithms for the processing of big-data for providing real-time feedback to learners. Contributing Editor: Swamini Shah, IntellADAPT, Boston, MA 02125. For more information, please refer to http://intellADAPT.com/BLSAT or contact Dr. Nish Sonwalkar at nish@alum.mit.edu.